Pet grooming may not be rocket science but if that's the case, why do so many pet grooming shops have such rockin' signs? Oooo! 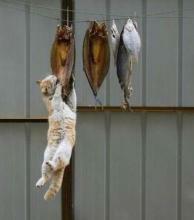 Dried fish! This is my new favorite snack! Ride An Eagle Into Swimming Pool History! Summer is the time to get patriotic so you might as well take that spirit into the pool with you. Make it easy with a Bald Eagle Pool Raft. 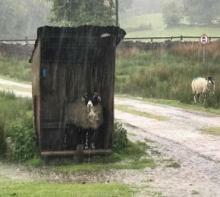 An opportunistic Swaledale sheep from Cumbria, UK kept its wool warm and dry by ducking into a worn wooden bus shelter during Storm Hector. 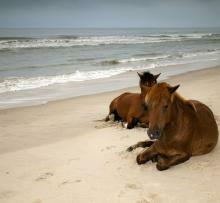 When it comes to a lazy summer day even the horses of Assateague Island enjoy relaxing on the beach. I think I can really get into the way humans go fishing. First of all I have a hat full of cat toys to wear. What about animal Dads who have the added onus of bearing their young. That’s right. Oh, I love hanging out in water! And I've got this dog paddle thing down. A company called Feline Innovations has innovated a handsome cat scratcher with removable scratching surfaces that come in three different fabrics - so your cat can scratch what he likes best.